There are 2 main types of kidney issues in rats, the first and most common is Kidney degeneration, which is a gradual decline of kidney function which eventually leads to failure. This is one of the most common cause of typical ‘old age’ symptoms in rats, especially male rats. It is caused by the gradual wearing out of the kidneys. The kidneys are incredibly important organs with multiple functions including; filtering out the waste into urea and ensuring any good stuff (proteins and amino acids) that have been missed so far are captured. They also act with the lungs to keep the bodies PH balanced and stable by managing the bicarbonate and hydrogen levels in the blood, acting as a Blood pressure management system, controlling urine concentration as well as salt, excreting hormones that trigger the production of red blood cells as well as Calcitriol (Activated vitamin D) which controls calcium and phosphorous absorption and renin which controls potassium and salt absorption as well as being critical to managing blood pressure. The second is acute kidney failure (sometimes called acute renal injury), which is where the kidneys start shutting down in a very short time frame, and can see a rat go from happy and well to on deaths door in sometimes as little as hours. This can be caused often caused by infection and can hit even very young rats. If your rat is exhibiting these symptoms make sure that you take them to the vet to be tested as medication that can help is available (typically a diuretic). Dietary support is also incredibly valuable both in delaying the onset of kidney failure and supporting it once it is there. Kidney failure is usually managed in the main by diet; it is not something that can be fixed as such. 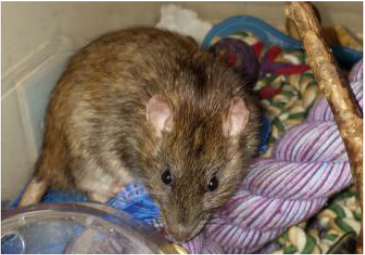 Ace inhibitors have been proven to help slow degeneration in affected rats and may help the rats live longer and diuretics can also help by flushing the system more often, though these can act to artificially dehydrate a rat so should be used with care. Your vet should advise you to look at their diet but it may be worth discussing the possible medication as well. In larger animals it would be normal to carry out blood tests, however in rats the disease may progress too fast for this and taking bloods from a very unwell rat can be a bad idea. Urine tests, particularly for sediment may be useful. As in many cases with rats it is worth using the symptoms and feel of the kidneys to prompt the trial of appropriate medication. If the rat responds then this is the best indication you are treating the right thing. Whilst this isn't normal procedure in larger animals it is the standard approach to most unknown rat illnesses. IV or SubCut Fluids . Antibiotics where infection is likely or the cause is unknown. In particular Septrin or Amoxicillin (injectable if the rat is seriously ill). Antacids may be useful if the rat is eating as kidney failure can cause increased gastric acid production. Supportive feeding as acute kidney failure often causes a disinterest in food. Encourage drinking, use fruit juices, honey water etc to encourage drinking if necessary. Avoid high potassium foods as AKI can cause potassium levels to spike at levels which can disrupt or stop the heart, as opposed to normal kidney failure where they are often very low. Avoid none steroidal anti-inflammatory unless absolutely necessary. Note: In dogs and cats with acute renal failure about 60% of cases are fatal, this will be much higher in rats where dialysis and IV fluids are not a practical option. The sooner this is treated the higher chance of the rat making a full recovery. The longer the kidneys are in the failed state the more other organs and the kidneys themselves are damaged and so the chances of survival are diminished. As such fast treatment and high end doses are critical to improve chances of survival.